The book is selling like crazy! 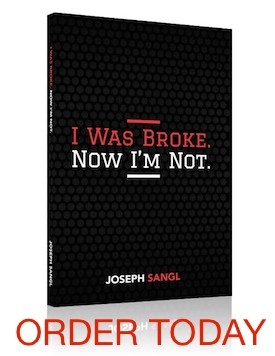 I can't believe it, but this book I wrote called I Was Broke. Now I'm Not. is selling like crazy! I am so humbled that people would spend their hard-earned money on this book. The tools that I teach in this book are THE TOOLS that Jenn and I used to become financially-free, and we still use these same tools to this very day. So the book is selling well, and then someone like Kem Meyer decided to spend some of her time reading it, AND she wrote a REVIEW. Let's just use some objective proof of what has happened since Kem's review – Amazon is nearly out of stock (two ZERO left as of this writing). UNBELIEVABLE! The book is available for immediate shipment via PAYPAL and will be available through Amazon.com within the next couple of days. Thank you, Kem, for taking the time to read the book and writing a review! I am FIRED UP by what I get to do this for a living! I Was Broke. Now I'm Not is available via AMAZON.COM, BORDERS.COM, and PAYPAL. You can read the Introduction HERE. That should mean more squares will be disappearing quicker also!